Building the perfect portable Bluetooth speaker isn't just about making one small and light; it's about getting that perfect mix of features. To our mind, that means a speaker with a small body that's easy to carry around; something that can withstand the elements if it's to be used outside; decent battery life; and sound that will impress. Crucially, in such a crowded market, there can be no compromises. Libratone seems to have ticked all of these boxes with its $119 (£99, around AU$150) Libratone 'Too'. This neat-looking, easy-to-carry speaker is splash proof, promises a 360-degree sound experience and looks great, too. Libratone almost pulls it off, with only a couple of minor points holding this speaker off top marks. Getting that balance between practicality and good looks is a tricky job, but Libratone has managed it with the Too. Its tubular body, comprised of soft-touch plastic and a material speaker mesh, looks fantastic, if not a little like a fancy travel umbrella. There's a range of colours, with the red and green options giving off a 'look at me' vibe; the grey and black options are slightly more subtle and refined. With a rubber loop at the end of the speaker, picking the Too up is easy. We'd have liked a slightly larger loop so that the speaker could be worn around the wrist, but that's a minor complaint. Flip up the rubber cover on the side of the speaker and the micro USB charging port and 3.5mm audio input are revealed. By covering these ports, Libratone gets the Too its IPX4 rating. In plain English that means that the speaker is splash proof, so you can use it if it starts to spit or you're by a pool, just don't take it in there with you. On top is the single power button and the fancy-looking Libratone logo that doubles up as a multi-control. Swipe your finger around the edge, and you can adjust volume, with LEDs neatly lighting up to show you the current setting. A single tap plays/pauses music, or answers/ends a phone call. You can't control media playback with multiple taps, such as a double-tap to skip tracks. Instead, a double-tap gets the Too ready to create a stereo pair with a second Bluetooth speaker - a feature that we can't imagine many people will use. As neat as the touch control is, it's a little fiddly to use; we found that we kept pausing music rather than adjusting volume. Finally, the logo also doubles up as a battery meter. Tap the power button while the Too is turned on and the LEDs around the logo light up to show you the current power level. The lights are a little tricky to see outside, and slightly brighter LEDs would have been good. As it stands, you may need to cup a hand around the Libratone logo to see the charge status on the brightest of days. With a portable Bluetooth speaker that you're going to use in a wide-variety of positions and locations, getting high-quality sound without having to find that sweet-spot is exceptionally important. To that end, the Libratone Too promises 360-degree sound. Two upwards firing 1.5in full-range drivers fire the audio out of both sides of the speaker mesh, while the non-directional passive radiator is there for added bass. It works well. Drop this little speaker in the middle of a picnic with friends, and you'll all get the same sound quality. Moving around doesn't affect anything, either, so you can mainly just dump the Too where it's most convenient to place it and carry on. Audio quality is a bit mixed and, in particular, the Too doesn't have much bass presence. It's an issue that is more pronounced at higher volumes. As we pumped the volume up, the high-end and midrange get louder, but bass lagged behind. We found that keeping volume around the middle or lower gives a better balance. A defined high-end and mid-range brings out the finer detail in most tracks, with clean and pleasant-sounding audio. 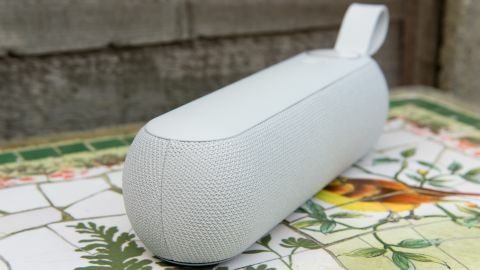 But the Too doesn't quite deliver the same level of attack or excitement as its competition, such as the fully-waterproof and bass heavy UE Wonderboom. Using the Libratone app (Android and iOS), you can adjust the Too's audio, choosing genre-specific profiles. Audio changes are quite subtle and, to our ears, didn't make a huge amount of difference. All this isn't to say that the Too is bad. It's not, and the clear-sounding audio it produces is pleasant. Instead, it's more the case that the competition has improved markedly over the last few years and there's a lot of other products to choose from that sound that little bit better. Libratone claims that the battery is good for more than 12 hours, which is pretty good going and means that you're unlikely to need more power when you're out and about. As well as playing music, the Libratone Too doubles up as a speakerphone thanks to its built-in microphone. A tap of the touch button on top answers or hangs up a call. Call quality is great, with the Too easily picking up our voice from a few feet away. A refined and stylish Bluetooth speaker, the Libratone Too looks great and has some neat features, such as the innovative (if not fiddly) touch controls. Clean audio delivered out in a 360-degree radius isn't to be sniffed at either, but the bigger issue is that the competition at this price is exceptionally strong. Currently, the excellent UE Boom 2 costs about the same, but is fully water proof, has better controls and slightly better audio. That makes it the better buy for most, although the more style conscious might appreciate the refined styling of the Too more.